The QuiltingBusiness.com affiliate program can pay you to direct quilters to the proven, money-generating sales letters. The affiliate program, only available with the electronic version of the book, pays you 50% (after ClickBank fees). And, since the sales letter currently converts between 1% and 11% of the traffic that visits one of my sales letters, you are almost certain to make sales if you have a list of quilting enthusiasts. To join the affiliate program, you must first register with ClickBank and get your ClickBank “nickname”. Registering with ClickBank is completely FREE and takes lest than five minutes to join. Click Here to Open a ClickBank Account! Once you have your Clickbank ID (or nickname), come back and follow the instructions below on how to promote any of my Quilting Business products available through the ClickBank affiliate program and earn 50% commissions (after ClickBank fees) on each ebook you sell! This is a book geared towards helping someone start, run, and market their own successful machine quilting business – a business where they offer a service geared towards other quilters. Use this link to promote “How to Start Your Own Machine Quilting Business” in your ezines, email promotions, and on your website. Here is proven copy that has worked well in ezine and offline classified advertising. This book is geared towards helping someone start, run, and market their own successful quilt shop, a retail establishment where people sell fabric and quilting supplies, and also offer quilting classes. 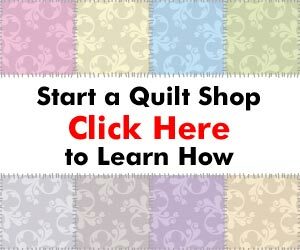 Use this link to promote “How to Start Your Own Quilt Shop” in your ezines, email promotions, and on your website. A business guide geared towards helping quilters turn their passion into a full- or part-time quilting business. Use this link to promote “How to Start Your Own Quilting Business” in your ezines, email promotions, and on your website. The best way to create sales of of any of my quilting business ebooks is to do a review of the product in your own words — what you like about the book, how it can help the reader, what you see as weaknesses, and why they should purchase overall. When you use this method, simply direct the reader to click through your affiliate link (use the “Simple Link” method above). Your endorsement of the product goes a long way when promoting to your readers. If you have any questions or comments, please contact me at the email address below.